Cause: I was in the car with someone this morning and he asked me which album I’d pick off the top of my head as my ‘favorite album’. Effect: You’re finding yourself enjoying (hopefully) this review of Avraham Fried’s Chazak. Track 1- Chazak! : Starting off the album is the title track, Chazak. A fast-paced song written by Yossi Green, it’s likely to have you tapping your feet right from the beginning, and through the very last beat. From the constant drum beat to the backup percussions and fun harmonies, this song is guaranteed to please. 4 stars. Track 2- Udvorov: In contrast to its predecessor, which had a strong drum-vocal intro, Udvorov starts off with a slow, pretty intro. Another composition of Yossi Green, this song is relaxing and great for listening to while dozing off…unless you want to sleep for more than four minutes that is. Right around then the song picks up, a fun back and forth as Avraham Fried sings through part of the daily Shacharis, which is topped of very nicely by him and Yossi Green singing alternating lines. The song cools down at the end, finishing off as it began. 3 stars. Track 3- Didoh Bei: Wow, Didoh Bei…need I say more?! Very possibly the most popular song since Yisroel Williger’s Hu Klal (The Voice), Yossi Green’s classic was being hummed and sung in Yeshivos and workplaces alike for years after it hit the market. A leibedik hora, many would argue that it’s worth buying this album just for this song! Enough said. 5 stars. Track 4- Tiher: A very slow song which doesn’t quite do it for me, but does show off Avraham Fried’s vocal range. Granted, I do like this song more now than I did as a kid, primarily because now I know what the words mean. (It’s the story of Rabbi Yishmael being killed as one of the Asara Harugei Malchus; I’m pretty sure the words are taken from Arzei Halevanon in the Yom Kippur davening.) It’s not a bad song, but just doesn’t do it for me. 2 stars. Track 5- Hashata: A fun song, and also a Yossi Green composition. Hashata is likely to have you snapping your fingers to the beat, if not straight out clapping (unless you’re driving of course). The words are from the Pesach Seder, when we say that although now we’re here (in galus), next year we will be free in Eretz Yisroel. Feel free to sing along! 3 ½ stars. Track 7- Tekah: This is really the only other song on the album that I didn’t enjoy (the other one being Tiher). It begins with a nice trumpet piece, which I assume is intended to be the ‘Horn of Redemption’; this is followed by a minute and a half of chazanus, as Avraham Fried goes sings through the bracha in Shemona Esrei where we request that Hakadosh Baruch Hu blow the ‘Horn of Redemption’ and bring us all from the corners of the Earth to Eretz Yisroel. The chorus is followed by a couple of lines in Yiddish, which I’m pretty sure is basically repeating the bracha. It really is a nice song, and to be honest with you, I’m not exactly sure why I don’t like it. 3 stars. Track 8- Mah Yedidus: Another very good composition of Yossi Green’s, Mah Yedidus is the dark horse of the album. For some reason it’s is a rarity in the Jewish music world, but this song’s words are from Shabbos Z’miros, and it actually finishes the zemer! Combine that quantity with the quality of a beautiful tune which (believe it or not) is not just a simple low part- high part- repeat twelve times, (rather this tune changes with each paragraph of the zemer, ending each paragraph with the shared chorus,) and you have yourself a lovely waltz that will paste a complacent smile on your face before the song’s end. 4 stars. Track 9- Levinyomin: This song is, in my humble opinion, the single most underrated song of the twenty-first century. Hands down. From the solid beat, to the booming bass, to the great guitar, this song is simply pumping. Simple, straightforward awesomeness. (In case I didn’t make myself clear, I really like this song.) Levinyomin is most certainly my favorite song on this album. 5 stars. Track 10- Adon: Yet another beautiful composition, Adon is Yossi Greens way of enticing you back to Earth after the last couple of songs. This smooth melody begins with a beautiful piano- violin introduction, and follows it up with soft musical arrangements throughout the song. Although it does begin to feel a bit repetitive near the end (kind of like this review), I feel that it’s still a very nice song, and particularly good for dozing off to. (Yes, that is meant to be a compliment) 3 ½ stars. Track 11- Koach: I must say, whoever chose the order of the songs did quite a good job. What better way to end an album than with Koach! Listening to Koach is kind of like catching a bus in the morning. Gently bringing you back from the peaceful serenity in which Adon left you, Koach starts off with just the strumming of a guitar and the snapping of fingers, country style. But then, just as you start feeling it, it picks up a bit as you realize you hit snooze one time too many. The clock ticks as you look for your left shoe, (and Avraham Fried starts singing in Yiddish,) and before you know it you’re grabbing a granola bar for breakfast as you hop out the door with your shirt half untucked. And the song keeps on playing. Before you know it you’re chasing after a bus that just pulled away from the curb, and when you finally catch it the bus driver starts yelling at you in some foreign language. (I’m pretty sure that’s Russian that Avraham Fried is singing now.) I guess the best word to describe Koach is ‘fun’. 3 ½ stars. 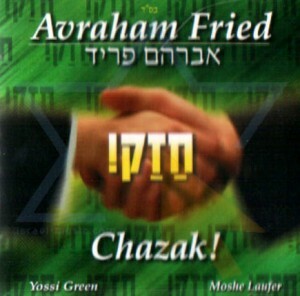 All-in-all, Avraham Fried’s Chazak is simply an amazing album, from the first beat through its last. I know I’ve said that I don’t like telling people how to spend their money, but this time I’m making an exception. If you haven’t heard this album yet then you are truly missing out, and I heavily advise you to go out and buy it at the soonest convenient time. I’m pretty sure that you can even find it on the clearance rack by now in most Jewish music retailers. I hope you enjoy this album as much as I have (and still will! ); please feel free to comment on this review.